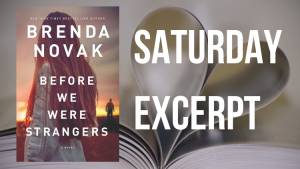 The latest from Brenda Novak hits shelves on December 4, however now is your chance to get a sneak peek at the latest from the New York Times bestselling author! 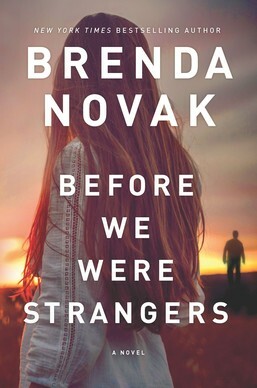 Keep reading for an early look at Before We Were Strangers. As far back as Sloane McBride could remember, she’d been told she was an ice queen. Even the people closest to her, especially the people closest to her, complained about her reserve. Her height, her physical appearance and her vocation didn’t make her any more approachable, so what served her well profession- ally worked against her personally. She heard people mutter words like stuck-up, aloof or distant—and knew they were referring to her. No one seemed to understand that she hadn’t chosen to be standoffish. That was simply a byproduct of what she’d been through. She never talked about what she’d been through, however. If she could help it, she tried not to even think about her child- hood. But she’d always known she’d have to go back to the small Texas town where she’d been raised eventually. And now that Clyde was gone, she didn’t feel as though she could continue running from the past. When she lost him, she’d lost her emotional safe haven here in the Hamptons, her excuse for remaining in New York. Sometimes she’d tell him and sometimes she wouldn’t, but he never pressed her, regardless. That was one of the things she’d loved about him. He’d say, “Still waters run deep” or something else that gave her permission to be comfortable in her own skin, and then he’d return to his other friends, where he would continue to talk and laugh until late in the night—simply winking at her if she happened to come into the room again. “Of course they were sleeping together,” the friend had agreed. Sloane had been tempted to inform them otherwise. Instead, she’d slid her sunglasses up higher on the bridge of her nose and tried to ignore them, along with all the other people who were, no doubt, speculating about the same thing. Chances were they wouldn’t believe her even if she told them, but she hadn’t been the younger woman trying to take advantage of the rich older man. Yes, there had been twenty years between her and Clyde and, yes, they’d been very close. He’d been her friend, her confidant, her mentor, her modeling agent and even her landlord. She’d been living in the small cottage behind his mansion ever since he’d talked her into walking out of that coffee shop in Portland where she’d been working when he’d come to town for his ex-wife’s funeral. But he’d never been Sloane’s lover. He’d never even hinted at any romantic interest, and that wasn’t what she’d felt for him, either. The size of the lump in her throat threatened to choke her as she straightened. But she had a lot to do, couldn’t focus on the loss or the pain. She’d survived thus far in life by always looking forward, never back, and the next few days would be busy. She had to pack up her belongings and move. Clyde’s estate would go to his heirs, the same group of people who were waiting for her to leave. They’d given her notice months ago that they planned to put the place up for sale as soon as he died. She gripped her purse a bit tighter with her left hand while turning so that she could wave with her right. Facing Clyde’s family even for that brief moment wasn’t easy. She could feel the gale-force wind of their disapproval pressing on her back, threatening to blow her right out of the cemetery. Only a couple of them bothered to acknowledge her in return. Even then, the responses were half-hearted. Doesn’t matter, she told herself. Clyde had loved them, which meant she’d always treat them kindly. She’d also abide by their wishes regarding the house. Even though she’d earned plenty of money since coming to New York and had tried to talk him out of it, Clyde had left her part of his vast fortune. Not nearly as much as each of his kids but some. That was probably the reason they seemed to hate her even more since he died, but she was going to accept his gift just as he’d wanted her to. He’d said he was grateful for the hours of thoughtful conversation she’d provided over the years, the scuba diving trips they’d taken together to Hawaii, the atolls of the Maldives and Australia, the late-night laughter and all the hard things she’d had to do in order to care for him over the past fourteen months while he battled bladder cancer. None of his children had been able to help for longer than a couple of hours here and there. They were too busy with their own lives. They’d suggested hiring a nurse, but Sloane had refused to leave his care to a stranger in case he’d feel as if, now that he was no longer able-bodied, he was to be cast aside while the rest of the world moved on. To avoid that, she’d given up her career. She’d hated knowing that his days were numbered, had wanted to spend as much time with him as possible. She probably wouldn’t have worked for much longer, anyway. Modeling wasn’t any fun without him. He was so good at shepherding her from one pinnacle in the high-fashion world to the next, she couldn’t imagine continuing with someone else, couldn’t bring herself to replace him. It was his intervention that had pulled her out of her desperate circumstances in the very beginning and had given her some semblance of a life—a life, as it turned out, that many people now envied. Representing brands like Prada, Gucci and Dolce & Gabbana certainly sparkled on the outside. Sloane was grateful for what she’d achieved, but in this moment, it felt as though that chapter of her life—the New York chapter—had come to a close with Clyde’s death. So she’d decided, finally, to close the chapter she never had—the Millcreek chapter. The one she’d run away from so many years ago. She owed it to her mother. And who could say? Maybe Sloane’s instincts had been wrong all along. Maybe she owed it to her father and brother to find the truth, too, and dispel all suspicion. Her phone rang as she climbed into her Jaguar. Caller ID revealed a Texas area code. She frowned as she stared down at it. It had to be her new landlord. Other than Paige Patterson— Paige Evans now—her closest friend from high school who’d reconnected with her last year on social media, her landlord was the only person who knew she was returning to town. Her finger hovered over the talk button. Just thinking about going back to Millcreek twisted her stomach into knots. Was she ready to return? No, but she wasn’t sure she’d ever feel ready, and she doubted there would be a better time to do battle with her father. She’d come to a natural break in her career. She had the financial wherewithal to be able to live without an income. And thanks to the strength she’d received from Clyde’s unwavering support, she now had the determination to finally achieve the answers she sought—no matter what it meant. At least she hoped she had the determination. Her father had trained her and her older brother to believe that loyalty mattered above all else—even truth. Would she be able to cross him? “Yes?” In the distance, she could see Clyde’s family gather- ing around his grave as though they’d been waiting for her to leave so they could approach. Two weeks ago, she’d gone online hoping to find a place to live in Millcreek when she returned. Clyde had been so weak. She’d known he was down to days, maybe hours, and that she’d have to move soon. But there hadn’t been much available in her hometown and nothing set off by itself; space she would need if she planned to retain both her resolve and her sanity. She’d thought she might have to buy a house—or build one—which would take so long and be such a hassle. But then she’d spoken to Paige, who’d mentioned that Hazel Woods, Sloane’s former piano teacher, a woman now in her eighties, was going into assisted living, and her son-in-law—this Guy Prinley—was planning to rent her secluded Spanish pueblo-style, two-bedroom, two-bath home, which also had a large music studio. Sloane was sold the minute she heard the place also had a newly designed kitchen and wide patios that were heavily shaded by the same vines and trees that all but hid the house. “Sent it back?” she echoed. “I’ll have to call you back,” he said and disconnected before she could express her full outrage. Sloane dropped her phone in her lap. She didn’t have the emotional fortitude to deal with something like this today. She’d just buried her best friend! She pressed a hand to her forehead as she sat there, wondering what to do—until she noticed the way Clyde’s family kept glancing over at her. Apparently, they were bothered to see she hadn’t left. “Oh, for God’s sake! I’m going, I’m going,” she grumbled, and used her Bluetooth to call Paige as she backed out of the parking space. “Hey, are you in town already?” Paige asked. The lump in Sloane’s throat swelled even bigger. She was tempted to jump at Paige’s kind offer, but she also felt guilty. Once she’d graduated from high school, she’d walked away from Paige the same as she’d walked away from everyone else—without a backward glance. She’d had to cut all ties to Millcreek, or she knew she’d never really escape. Her father would use those she cared about to manipulate her if he could. Mention of Micah Evans made Sloane’s hands tighten on the steering wheel. She couldn’t help but feel his name right in her gut—even after all this time. He’d married Paige only months after Sloane left Millcreek. Her boyfriend and her best friend—such a cliché, and yet, she’d never seen it coming. She should have, she supposed. She’d known that Paige had a thing for Micah, could tell by the way she’d acted whenever he was around. But a lot of the girls at school had had a crush on him. Why wouldn’t they? He was the boy who had it all—looks, personality, intelligence and athletic ability in a state where football was everything. It was just that Sloane had never imagined he’d suddenly take an interest in Paige; he’d seemed so indifferent to her before.